If you are new to this, I recommend starting with the “About our Boondocking Life” page to see how this all started. I am not a “blogger” who constantly posts. This blog is intended to educate, not to be used as a discussion forum. Simply put; if you post questions here they will not be answered. Last, if you feel that I have helped you to save your money, take a look at my page: The Money Question. Please read my FAQ’s and look at my most recently dated pages before contacting me. There is where I will post the latest things. Tapping the circle to the left will open the comments that have been left if you are interested. The following are links to places I recommend that you look for more information. Insert the usual warning here. You must temper everything you find with common sense. There is both good and bad everywhere you look and I cannot keep up with everything anybody else says. My opinions follow. Some may not agree, but I speak from experience, not what somebody else told me. If a link doesn’t work try copying & pasting the link into your browser or just do a Google search. These things are finicky. I DO NOT APPROVE ANY ADVERTISING THAT GOOGLE ATTACHES TO THIS BLOG. THEY WANT $30 PER YEAR TO BLOCK ADS. http://cuernoverdesolar.wordpress.com Kelly’s Blog..A friend / former customer who also does not own a generator. http://kingsvista.wordpress.com An interesting blog about off grid RV life by another friend / former customer. http://www.jackdanmayer.com Some good solar & RV info from the big rig side of the RV life. Look here if you are made of money. Some of the info here is not correct and we do not agree on everything. It is up to you to think. http://bogartengineering.com Manufacturer of the Trimetric, the only battery monitor to buy. http://www.magnumenergy.com The best alternative energy inverter manufacturer and located here in the US. 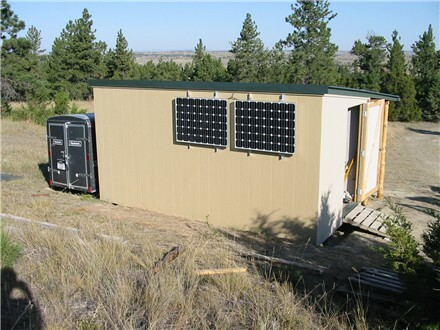 https://www.crownbattery.com I believe these to be the best after buying them for two off grid homes and installing in several RV’s These people have the alternative energy market in their sights. Look at the latest catalog. Look to Crown for AGM’s made in the USA. They added a new production line and hired 25 new people to run it. Probably the best AGM’s you can buy today. http://backwoodssolar.com These folks have a catalog available that has a LOT of good information in it. Their web site also has a learning center with a lot of valuable information and battery diagrams. Great service & friendly advice. (I am adding this comment in 2015… After having some very unsatisfactory dealings with other suppliers I need to say that buying for the lowest price is fine if you know what you are doing, but if you believe the advice you get at nearly every other dealer you are risking failure. I won’t list their names here, but be very, very careful.) Even here you need to balance what you are told with what the profit motive might be in selling you the latest MPPT controller that doesn’t work as promised. (My MidNite page explains why I added this comment in April of 2015.) Highest price does not guarantee highest quality. Sometimes it is very surprising that exactly the opposite can be true. https://therecklesschoice.com/category/systems/solar/ Finally, somebody who did a nice installation and good guide for a reasonable system using the Trimetric 2030 controller and meter pair. This is worth a look. IF YOU WANT TO ASK QUESTIONS, THIS IS NOT THE PLACE TO DO SO. You can email me after you have read the RV Battery Charging Puzzle, where my email address is included. THIS IS THE SHOP OF ONE SOLAR GUY WHO CAN BE TRUSTED. (This is an old picture. Look at newer pages for newer info.) This little system powers construction tools, heat shrink gun, you name it. The batteries in that shed were 10 years old when the photo was taken and have since been retired. They were charged daily at 14.8V with temperature regulation just like Trojan recommends. The batteries in there now are six year old T105’s that were free. Most of you are probably looking for the “RV Battery Charging Puzzle”. This is also good basic education for anyone who wants to go off grid in a cabin or small home. My email address is shown there, but please don’t contact me with questions unless you have read the Puzzle. You don’t have to read my rants under “The History”, but it explains how I ended up where I am today and gives some examples of recent solar system evaluations that demonstrate very well just how little has changed. There are now a couple of RV Solar dealers doing working systems but I will not recommend anybody yet. Both of those companies will sell you nothing but MPPT, even when it does not make monetary sense on small RV systems. MPPT does make sense on large systems only when you spend enough to get something like a Morningstar Tristar MPPT controller. These dealers’ advertising make it very clear that they are not “low budget” installers. Many people think that when they see advertising that shows huge over built systems on the roofs of RV’s they are seeing proof that the company knows what they are doing. I believe that it proves just the opposite and that it is a bold statement about their real mission statement (to generate as much profit as they can). You also need to think about the power line that goes into the building. If they knew how to make solar power work, there would be a modestly sized solar array powering that building. They buy solar panels cheaper than you can and the same tax break is available to them. There is one guy in Quartzsite who put grid tied solar on his building, but that does not show that he knows how to charge batteries. He does not. The statement about having to add water every other day if you follow Trojan’s voltage recommendation came from that place. His actions speak louder than words to me. I met a new dealer in 2011 who lives off grid and yet he sells junk flush mount RV charge controllers at his booth. Again proving that he either doesn’t know or doesn’t care. Many of the dealers also still tend to fall down on the job on things that I find unforgivable, like the missing wiring protection on one system that I reported on, the constant overloading of controllers, the continuing refusal to install big enough wiring for MPPT to really have a chance at working and the denial of how important temperature compensation is. I’ll post it here first if this ever changes. You should note that Morningstar believes so much in the value of temperature compensation that it is included at no extra cost on all of their small RV controllers. They also include the remote temperature probe in the box when you buy their new Tristar MPPT controller. I constantly see people attributing statements to me that I never made. For instance, I have never said that nobody needs a generator and I never told people to sell their generator. I did say that WE don’t need one. Our back-up charger is our noisy Ford 7.3L truck & booster cables. It has only been used four times in over six years and one of those times was because of a failed solar panel. In 2014 we bought a used generator out of an RV, but it may take years to get it running. I filled the cylinder with oil and put it in storage.